Double dipping this week as I play catchup after our recent holidays. This one is in response to Ailsa’s Travel Theme: Outdoors and Sue’s: Ephemeral theme. 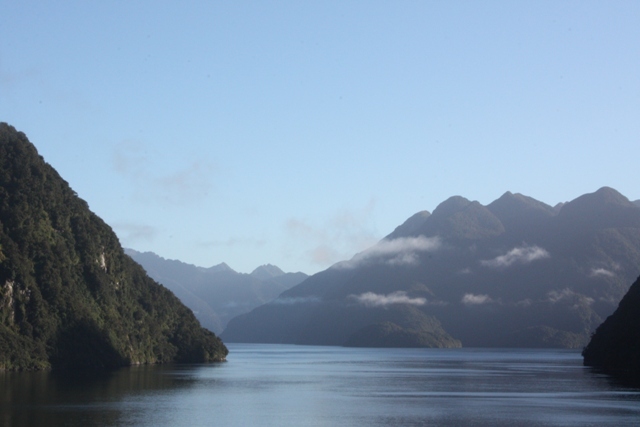 I hope you like this morning view of some fleeting clouds in New Zealand’s Dusky Sound taken on our recent cruise. I was thinking Norway or New Zealand…. both beautiful…like your photograph. Thank you. It’s easy to take beautiful pictures when the views are like this. I hope to get to Norway one day too. You would see some parrellels but in my opinion, Norway offers so much more. Ironically, when I was in Denmark I saw a billboard with a photo of an area similar to your photograph, with a heading saying: Norway? NO, New Zealand!! !” Many Danes have not visited Norway, but quite a few of my Danish friends have been to New Zealand…. Funny, that!! We do tend to take places closer to home for granted, don’t we? Yes, perhaps, but I think New Zealand has other treasures, whereas Norway is the king of the fjords!! !